Everyone remembers their first time. In the spring of 1977 my Jr. High rewarded its graduating 8th graders with a celebratory “Demonstration Day.” There must have been a dozen presentations but I remained fixated on the bright yellow teletype terminal. We got a lecture about computers and how this wasn’t one. The computer was in the district headquarters miles away. This was how you talked to the computer. Computers were very powerful and very expensive. One had to buy “CPU time” and it was measured in dollars per second! How it was an amazing luxury for kids to even be able to see a computer working. He did some math demonstrations. Ca-chunk ca-chunk ca-chunk it went printing to the rough yellow paper. Each time it went ca-chunk I wondered how many dollars it cost. He made a paper tape and I wondered if that cost extra. Then he said something I never expected him to say. We were going to get to take turns using the computer. Everyone asked, but no. We didn’t even have to pay! Being one of the smaller kids, I was up front for the demonstration. As a happy side effect I got to go first. Legs dangling in front of the keyboard, I pressed the letters as he called them out. My eyes widened as it ca-chunked ca-chunked words back to me. YOU ARE STANDING AT THE END OF A ROAD BEFORE A SMALL BRICKBUILDING . AROUND YOU IS A FOREST. A SMALLSTREAM FLOWS OUT OF THE BUILDING AND DOWN A GULLY. I was playing what I imagined must be the worlds most expensive game! I stood up as others took their turns. Sat back down every time someone declined to take theirs. I never moved from that spot. A NOTE ON THE WALL SAYS ‘MAGIC WORD XYZZY’. XYZZY was burned into my mind as the demonstration ended. Oh the pain of leaving just as the magic was starting. The only computer class available at my High School was called computer math. I couldn’t take it till I had completed algebra. There were no exceptions. A year and a half seemed a long wait to finish the game. The TRS-80 appeared like an oasis in the digital desert. The Radio Shack employees didn’t know what it was for. Most customers didn’t care. Mike and I rode our bikes up everyday and usually had it all to ourselves. We played nim and checkers. We hunted the wumpus using bent arrows. We learned to program by reading the demos apps. When we finished that we started typing code from magazines. We even ran demonstrations for interested customers. That is until the incident. Seems we got snippy with the manager when he tried to interrupt us in the middle of typing a long BASIC listing. (In our defense, there was no way to save!) We were booted! Oh well. Off to the next Radio Shack we went. A few weeks later, to the next. Then the next. We were riding about 10 miles each way to get to our fifth Radio Shack. I finally got to take computer math in my sophomore year. 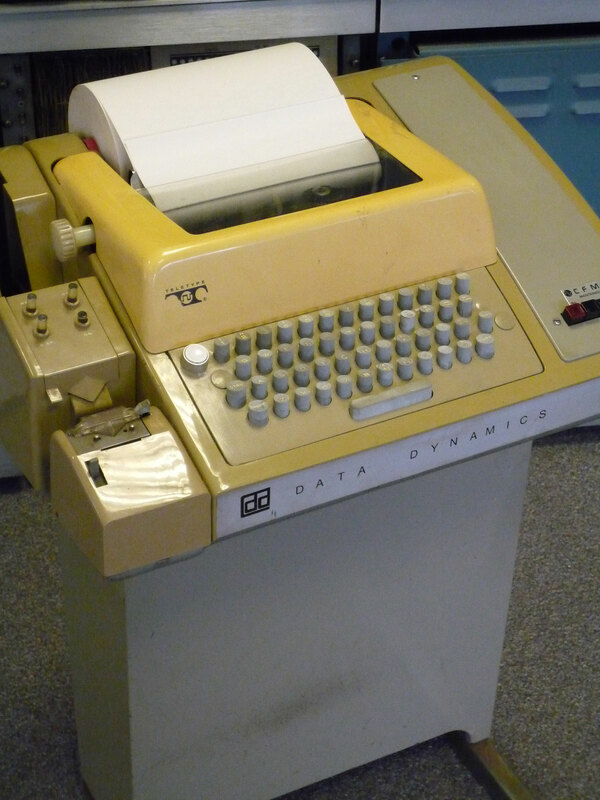 The class used the same ca-chunk ca-chunk teletype terminals, but a year with the TRS-80 made them seem dated. By 1978 there was no more talk about expensive CPU time. That concept just fizzled. To my disappointment there was no talk about computer games either. Instead we were to write serious programs. In BASIC. On notebook paper. In pencil. The big project was to write a program that would solve any quadratic equation. Only juniors and seniors knew what that meant. Though none, of course, actually cared. There were 28 students and 7 TTYs. Once your pencil program was done you had to type it in and print out correct results. When you finished you got to leave for lunch. For me this was a no win scenario. There was no way to get quality time on the terminal. If I got to the TTY first the others would stand over me and rush me off. If went last the clueless would use up all the spare time and I was rushed to get any lunch at all. This would not do. The programs were interesting but trivial compared to the TRS-80 ones I was used to. I could usually skip the pencil stage and type them straight into the TTY. When I finished I would check the paper programs of those behind me. If they had mistakes I would tutor them to avoid a long debugging session. Sometimes I even helped the slow ones type. It was a win-win. They learned, finished fast and got a long lunch. I usually got at least thirty minutes alone on the terminal. Yes! It was still there, and it had friends! By the fall of 1978 there were no willing Radio Shack’s left in riding distance. That Christmas Mike’s dad broke down and bought… an Apple! Color rocks! During high school I worked as a part-time photographer for a real estate office. They used a dial-up silent writer terminal to connect to the MLS service. Sure enough, even more than a year later, the school’s dial-up number and password from the math class continued to work. One had to know.